Creativity is critical. 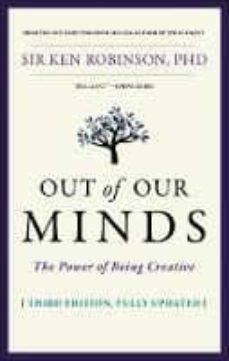 Out of Our Minds explores creativity: its value in business, its ubiquity in children, its perceived absence in many adults and the phenomenon through which it disappears and offers a groundbreaking approach for getting it back. Author Sir Ken Robinson is an internationally recognised authority on creativity, and his TED talk on the subject is the most watched video in TED s history. In this book, Sir Ken argues that organisations everywhere are struggling to fix a problem that originates in schools and universities. Organisations everywhere are competing in a world that changes in the blink of an eye they need people who are flexible enough to adapt, and creative enough to find novel solutions to problems old and new. Out of Our Minds describes how schools, businesses and communities can work together to bring creativity out of the closet and realise its inherent value at every stage of life. This new third edition has been updated to reflect changing technologies and demographics, with updated case studies and coverage of recent changes to education. While education and training are the keys to the future, the key can also be turned the other way; locking people away from their own creativity. Only by actively fostering creativity can businesses unlock those doors and achieve their true potential. This book will help you to: Understand the importance of actively promoting creativity and innovation. Discover why creativity stagnates somewhere between childhood and adulthood. Learn how to re-awaken dormant creativity to help your business achieve more. Explore ways in which we can work together to keep creativity alive for everyone. Modern business absolutely demands creativity of thought and action. We're all creative as children so where does it go? When do we lose it? Out of Our Minds has the answers, and clear solutions for getting it back.